Following swiftly on from the action at the new Korean International Circuit, we're heading to the even newer Buddh International. With just one race under their belt, organisers of the Indian Grand Prix are hoping for an exciting weekend - and after two relatively downbeat races (by 2012 standards), we could also do with something to pique our interest. Both championships are still up for grabs, and there are fierce battles throughout, but can this weekend deliver? It was another Red Bull dominated weekend in Korea, with Sebastian Vettel securing victory and the lead of the championship. It was another first lap catastrophe for Jenson Button and Nico Rosberg, with both McLaren and Mercedes looking for some better results this weekend after a string of difficult weekends. Things were looking up for Nico Hülkenberg and for both Toro Rosso drivers - and with a heap of young drivers starting to make news with the impending Young Driver Test, there's a lot of pressure on the midfield racers. Support racing for this event includes JK Racing Asia Series, and MRF Challenge. The five day forecasts feature nothing but sunshine above the Buddh circuit, with temperatures sitting at the 30 degree mark. There's not much variation across the weekend, with the sun shining each and every day. The weather forecasts can't always be taken as gospel, but this looks more convincing than most! The Indian Grand Prix of 2011 was not heralded for its overtaking, and the FIA have looked into the matter, tweaking the DRS zones for this weekend's race. There are two distinct overtaking areas, with the first around the final corner and onto the home straight. The second detection zone occurs around the third turn, with activation down the extra-long straight that follows. The second zone has been extended for 2012, with 80 metres added to try and encourage overtaking. Depending on how you count it, last year's Indian GP had about six overtaking moves, so we could definitely do with some improvement in that area. The Buddh International Circuit was brand new last year, and so teams and drivers still won't be 100% sure what to expect when they arrive for this season's action. 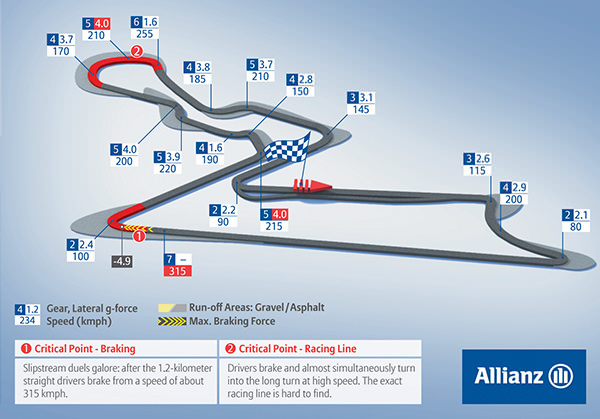 The track itself is a demanding one, with plenty of high-speed corners to keep concentration at a maximum. Just as the Korean circuit is abandoned during the rest of the year, Buddh International also faces a dearth of activity, so grip on the surface of the track - particularly during the early sessions - will be at a premium. Meanwhile, in "tiny updates to the circuit" news, there's some additional kerbing and artifical grass put in at various points, whilst some guard rails have been re-aligned as well, particularly at turn 10. The FIA have tried to herald the Indian GP as the only true clockwise circuit in the last seven races on the calendar, branding Suzuka as a figure of eight. I'd say that it's still clockwise, but even so, the drivers will need to start preparing their necks for some anti-clockwise action! 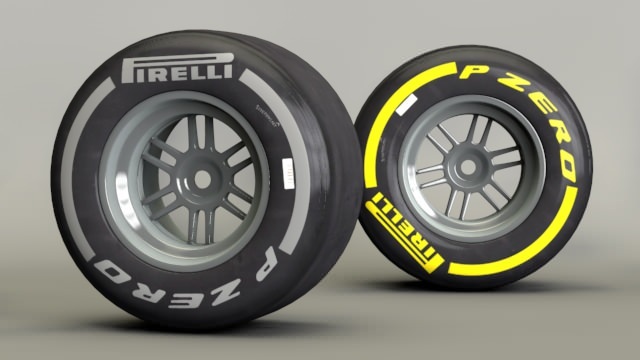 Just like last year, Pirelli have opted to bring the hard and soft compounds to India, hoping to "strike the right balance between performance and durability." The tyre compounds have changed slightly this year compared to last, of course, and motorsport director at Pirelli, Paul Hembery, believes that they are a less conservative choice. The circuit layout is one of the toughest that our tyres will face throughout the second half of the season and it’s also the last time that we will see the hard and soft combination this year, which was previously used in Barcelona, Britain and Japan – which gives you some idea about the demands of this circuit.